2015 is said to be a complicated year for the stock market. Although the positive long-term outlook of the stock market and Philippine economy is still intact, many investors are uncertain about investing given several risks in the short-term. These short-term risks are: expensive valuation, threat of capital raising, tighter regulations and under-spending by the government, a potential power shortage, and uncertainty caused by the upcoming presidential elections. 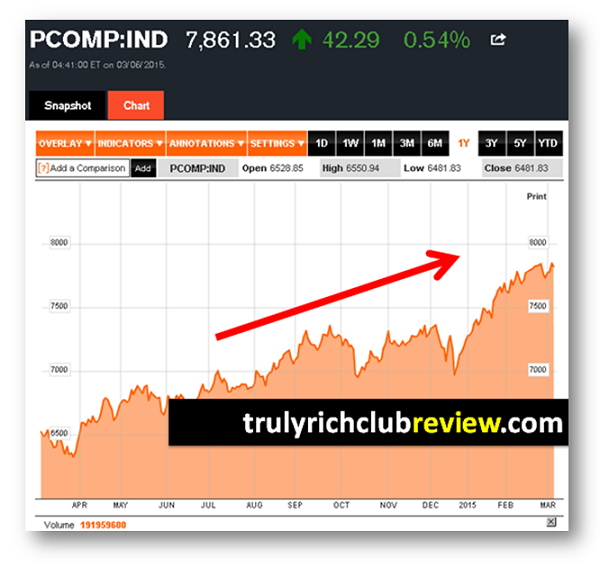 In spite these risks, we still believe that the market is well on its way to move higher this year, taking the PSEi to our target of 10,000 by 2020. What will continue the rise of the market is liquidity. Due to ample liquidity conditions, stocks remain the most rewarding peso asset class, even if current prices are expensive compared to historical levels. This relative attractiveness of stocks is here to stay for 2015 because of the ample liquidity environment locally and globally. Moving on the related news about the Philippines Stock Market, below you can read the we are still moving up and continue making new high-record day by day. If I am not mistake, today is the 19th record high for 2015, which closed at 7,861.33. "The local stock barometer resumed its upswing to post another record high on Friday as the slump in global oil prices is making the Philippines more attractive to portfolio investors. The Philippine Stock Exchange index added 42.29 points or 0.54 percent to close at 7,861.33. Across the region, trading was mostly buoyant due to an improved outlook on the European Union presented by the chief of the European Central Bank. Locally, ample liquidity is keeping most stocks at high valuations. “There are many foreign funds who want to have stocks from the Philippine market. The country (being a net oil importer) is a beneficiary of the fall in global oil prices so they are expecting better growth this year,” said Manny Cruz, chief strategist at local stock brokerage Asiasec Equities."